Farmers grow lettuce, spinach, broccoli and other vegetables in California's Imperial Valley, Central Valley, Salinas Valley and far northern counties. However, these nutritious foods are not readily available to local low income communities. Melon and plums are packaged for schools. New USDA rules call for snacks served at school to meet nutritional standards similar to those required of school meals. With an eye on reducing childhood obesity and improving overall health for children, the U.S. Department of Agriculture announced the final rule for snacks at schools. The rule made final on July 21 includes requiring snacks served at school to meet nutritional standards similar to those required of school meals. Young children and adults in care programs will now receive meals with more whole grains, a greater variety of vegetables and fruits, and less added sugars and solid fats. These changes please Lorrene Ritchie, Ph.D., RD, director of the Nutrition Policy Institute in the University of California's Division of Agriculture and Natural Resources (UC ANR). The U.S. government's new dietary guidelines take a bold stand on reducing sugar intake but should do more to promote drinking water, according to nutrition experts from UC Agriculture and Natural Resources. UC ANR's Nutrition Policy Institute (NPI) has led a push to get the government to make water the drink of choice in the guidelines and add an icon for water on the MyPlate food guide. The guidelines don't go that far, though they do include information that recommends drinking water – in the fine print. 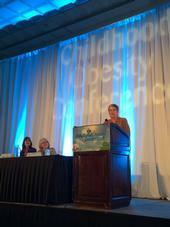 UC President Janet Napolitano speaks at the Childhood Obesity Conference as Lorrene Ritchie (left) and Patricia Crawford look on. It was the first time a UC president has taken part in the long-running and nationally recognized gathering, noted the director of UC Agriculture and Natural Resources' Nutrition Policy Institute (NPI), Lorrene Ritchie.